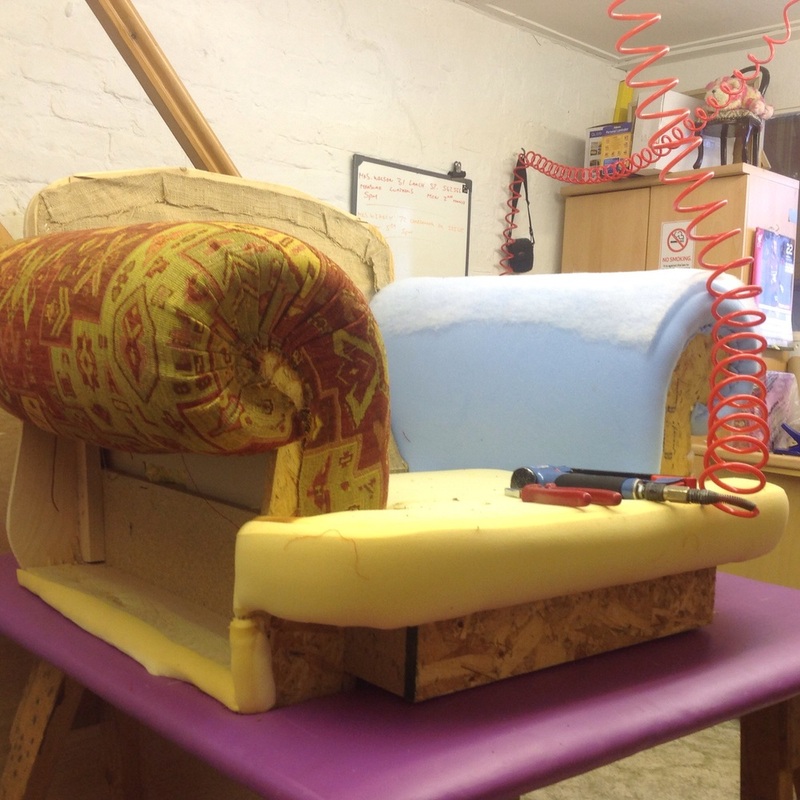 Transforming an electric reclining settee & easy chair. 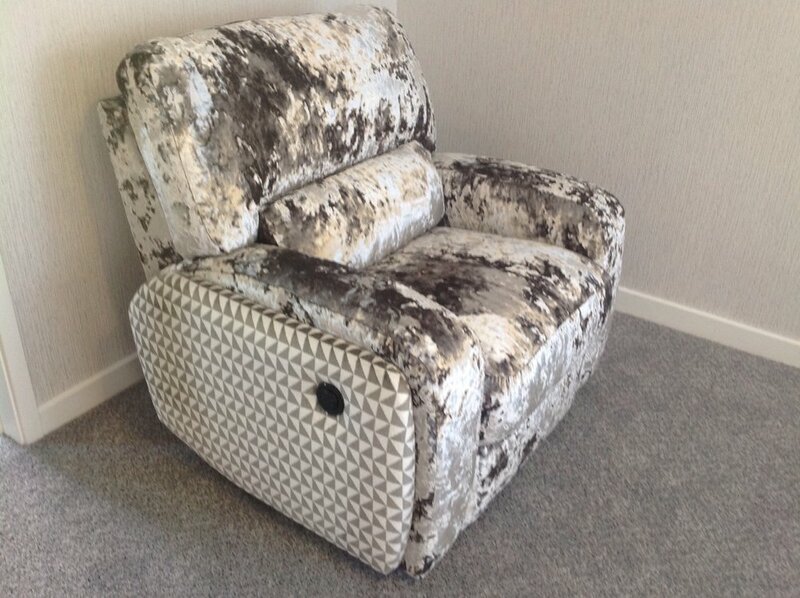 Fabrics, base Christine Marrone crushed velvet & geometric pattern on the outside Warwick metalium range. A two sweeter settee in the process of being stripped down. After being recovered! Stunning transformation. 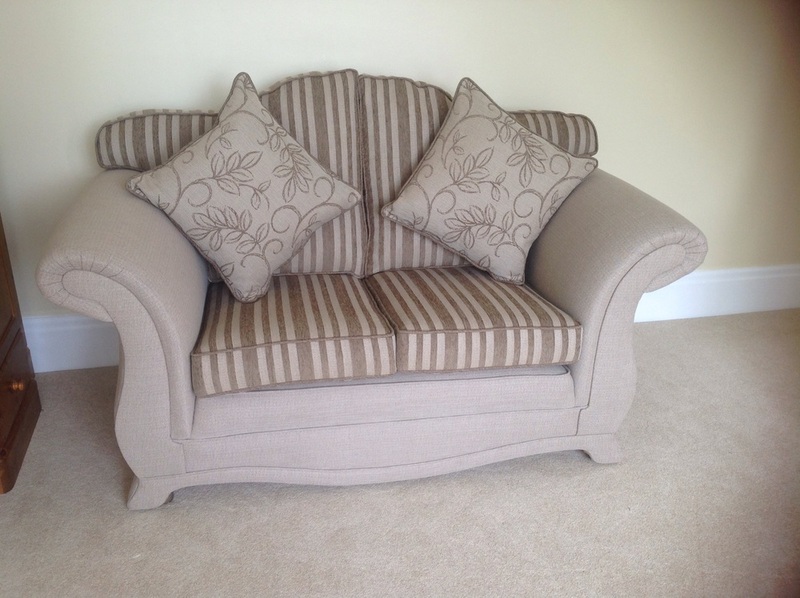 Pictured a large & small 3 seater settee, in co-ordinating fabrics. 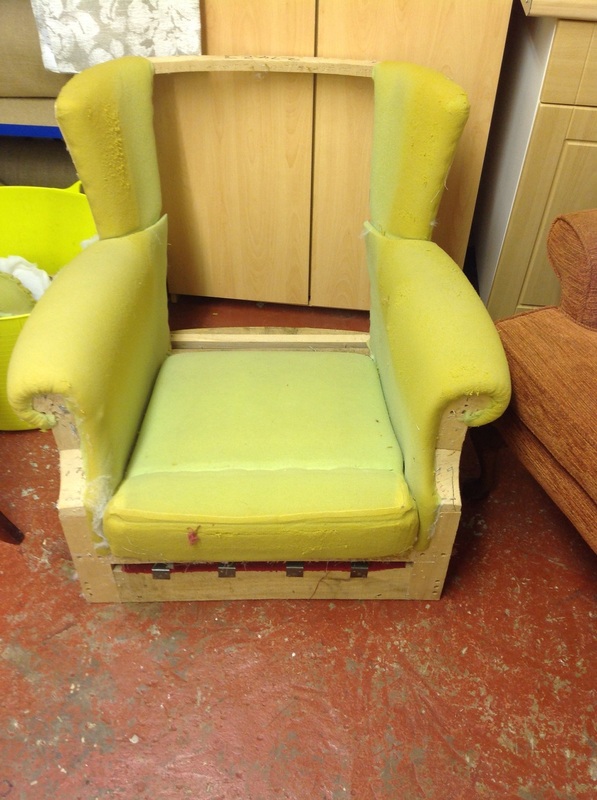 A matching easy chair after the cover is stripped. The picture before a transformation. Springs in the seat needed replacing, webbing & broken springs. Webbing up the traditional way, using hammer & tacks. 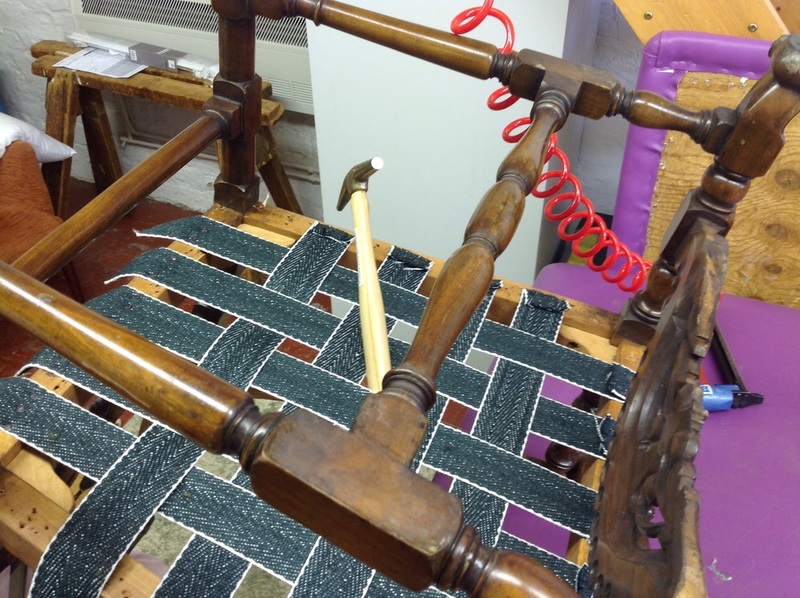 After the webbing & springs are sewn in by hand a heavy canvas is applied over & the old horse hair seat is placed back on using a tack stitch. A second canvas is tacked on. After the canvas is applied a top stitch is added using a 14inch needle. 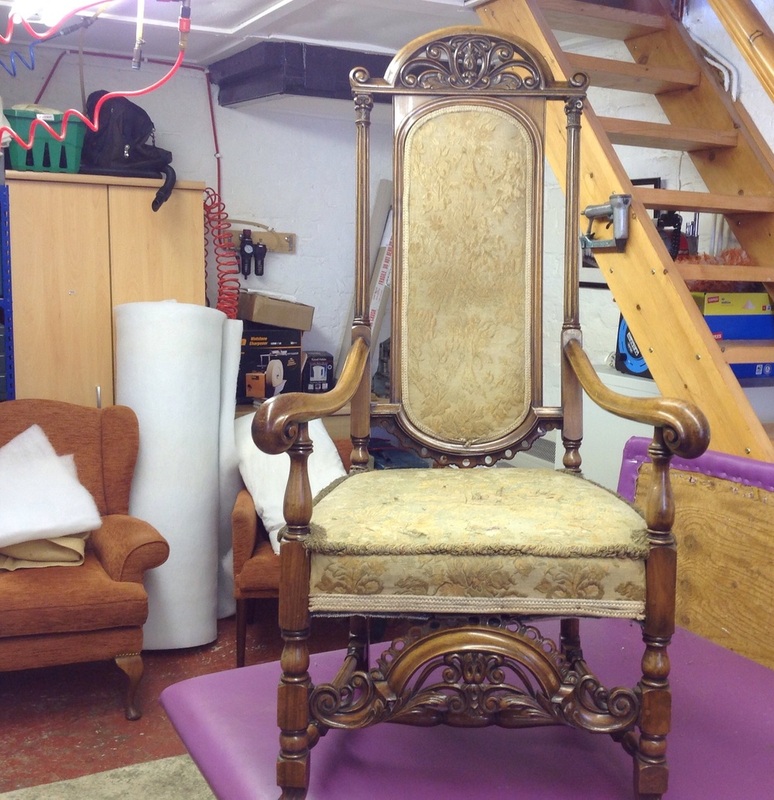 The finished chair in situe! Forum court retirement flats. The reception area, very very happy! 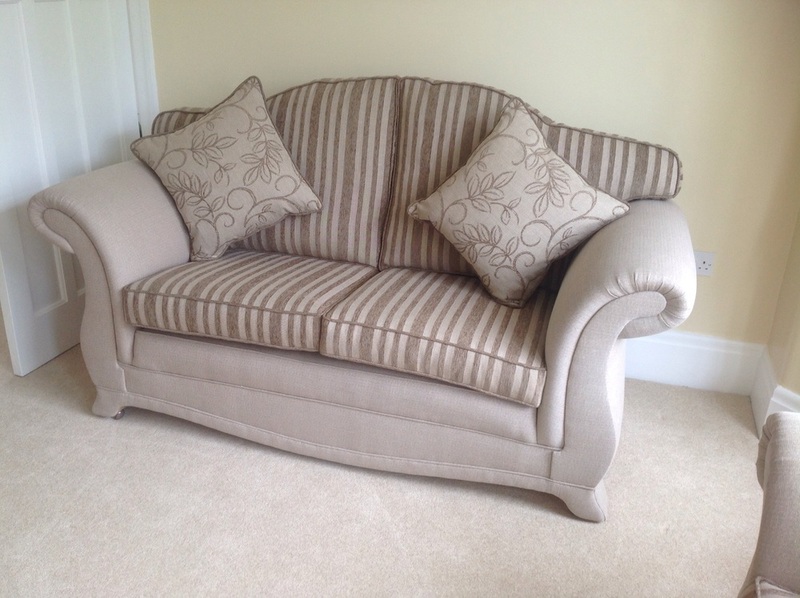 Fabric by Ross an FR contract chenille, finished off with brass studs! 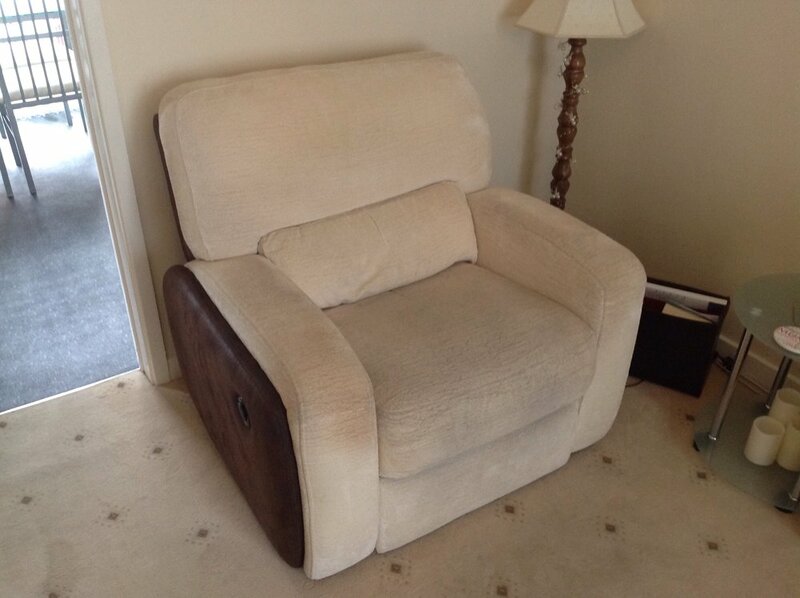 A two seater settee with a sprung seat in need of a makeover. The finished article, recovered in a Linwood fabric with cord edging. One of two matching easy chairs. Pictured with co-ordinating scatter cushions. Trickey chairs to recover, as they come to pieces & you've got to disconnect all the electrics. Fabric by Ross. A very happy Lady customer, she missed it very much while it was away. 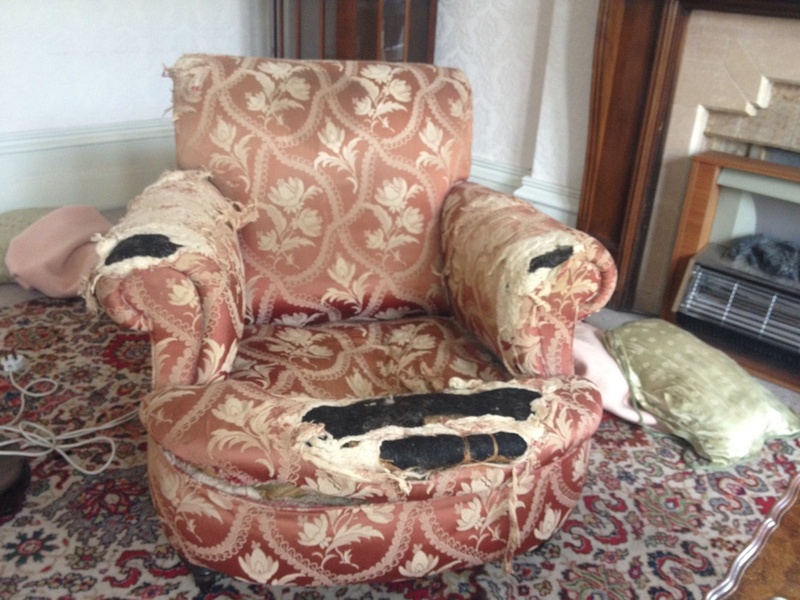 Recovering of an easy chair, part of a 5piece suite. Carefully stripping off the old cover, taking out all the old staples with a mallet, pliyers & a staple lifter. A painstaking job. During the recovering process! Renewing the arm foams. Re-padding of the back & seat. Great pleating work round the arms. 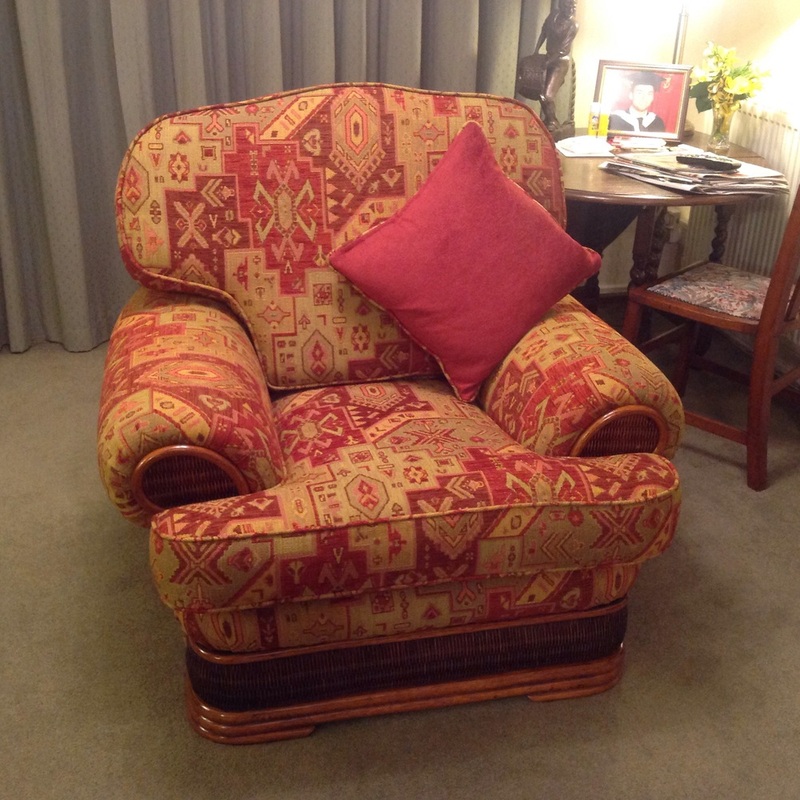 The finished chair in situe, fabric by Jim Dickens. A nice piece of furniture. 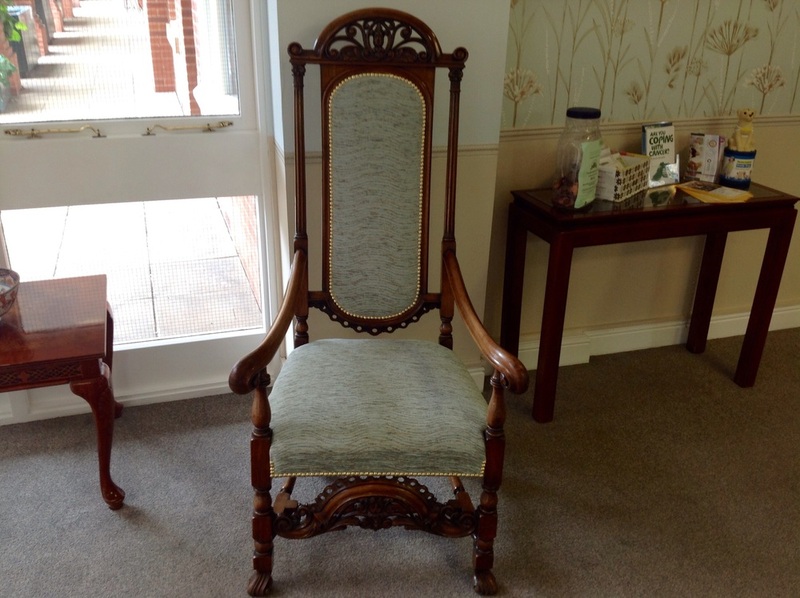 A family heirloom given a make over. 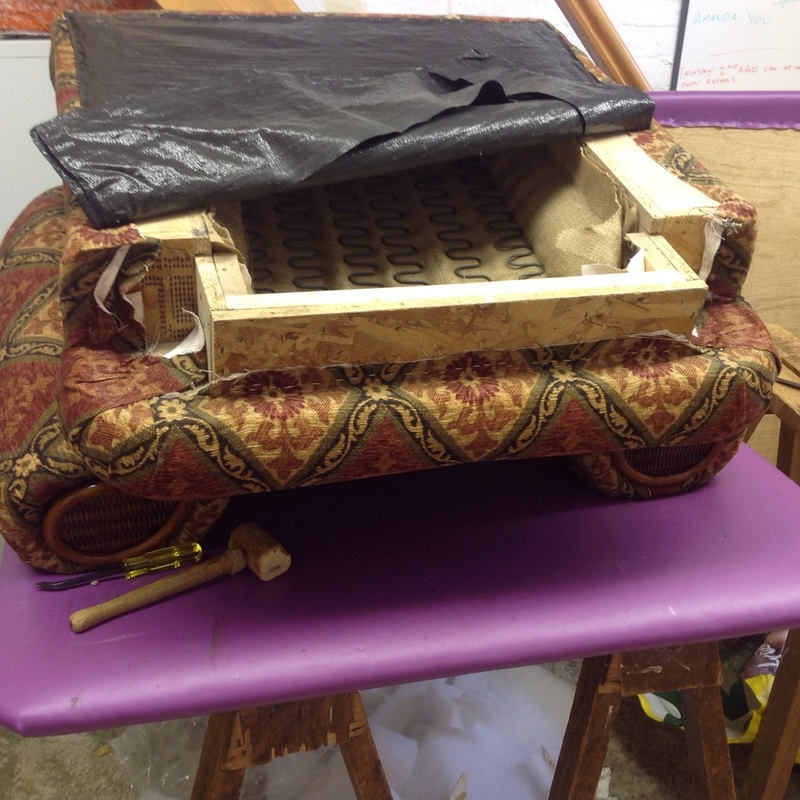 Photo shows the the Ottoman as we strip off the old cover. Apparently this piece dates from the turn of the century & has traveled over to France. Horrible old green velvet fabric, but we discovered at least two other fabrics underneath! During the recovering process, picture shows the pleating round the arm. The arm now complete & shows the inside lining. The finished article! Transformed. Fabric by Ross a crushed Slub velvet. A beautiful Ottoman / bedding box! & a thrilled customer too! 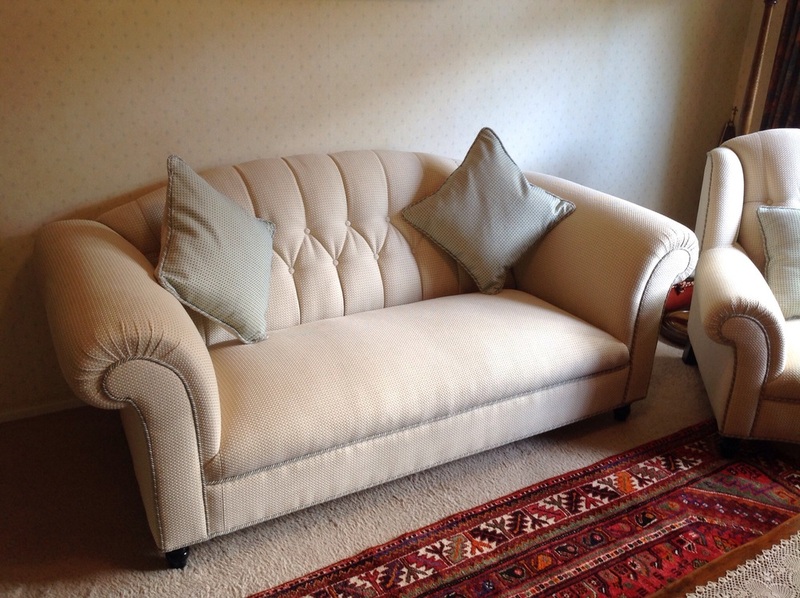 A 20year old loose cover settee, given a reupholstery transformation. The before picture. A tired looking couch! The finished settee. Fabric by Christine Marrone. Two new back cushions are premium luxury feather & down filled interiors. The before photo covered in a patterned green fabric. 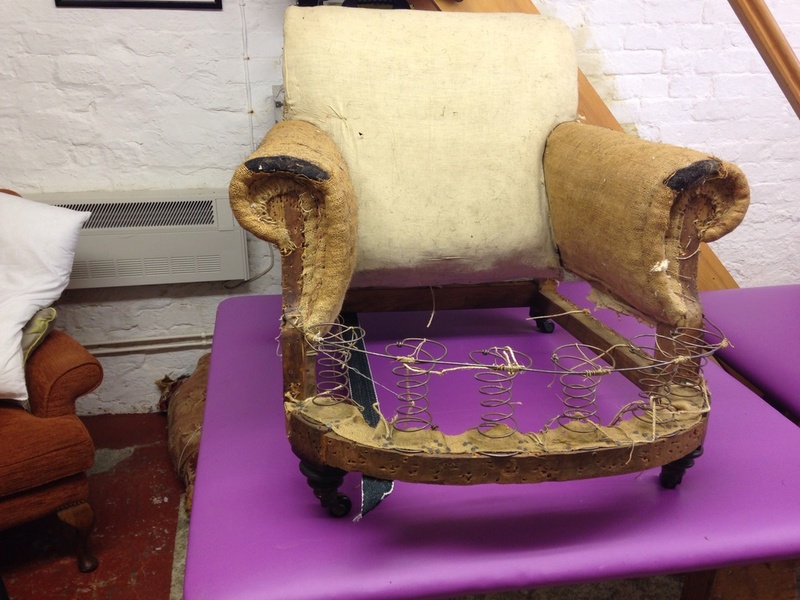 The stripped down chair showing disintegrated foam, which was replaced along with new back webbing. The finished articles in situe. Transformation! The before photo, the wreck! The finished chair lovingly restored in all it's glory.